“The Son of Gotham,” the Fox drama’s tenth episode of the year, opened with a funeral. It was meant to be a sobering moment, honoring a fallen GCPD officer and giving weight to Theo Galavan’s heinous acts throughout the first half of the season. There was nothing wrong with the idea; the issue came from the body in the coffin. Officer Parks was, as so many members of the Gotham police force have been this year, a sacrificial lamb in last week’s “A Bitter Pill to Swallow.” No more than an unfamiliar face, she was given three words of dialogue before being served to Eduardo Flamingo in gruesome fashion. 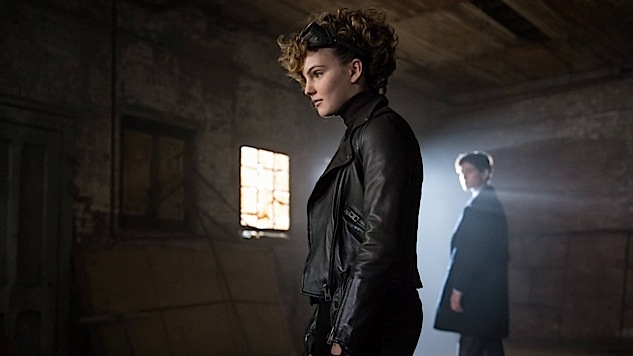 Gotham, after its bold choice to kill Jerome, has played this card copiously in season two. So many cops, most of whom haven’t existed long enough to be given a first name, have been thrown to the grave in an attempt to raise the stakes, or make it appear as though there are stakes at all. It hasn’t worked, instead highlighted one of the series’ core flaws. I hoped the shift to serialization in “Rise of the Villains,” the second season subtitle that becomes more and more a misnomer as weeks roll on, would allow the writing staff to focus on characterization and world building. With the craziness the show loves to throw at viewers, it undercuts its ability to shock, having failed to create a solid connection between the audience and its characters. Jim Gordon, the supposed hero, remains one-dimensional, as does his partner Harvey Bullock (Donal Logue, perhaps the most wasted talent on a show that makes a habit of it). Lee Thompkins is often no more than a face for Gordon to scowl at, Bruce is the most confounding 13-year-old boy I’ve ever seen and Selina is an interesting, but undercooked, take on a classic Batman face. The situation is a little better with the series’ two hangover villains, Oswald Cobblepot and Edward Nygma. Thanks to halfway decent origin stories last year, Penguin and future Riddler rank as the drama’s most developed characters, but they live far on the fringes, and are thus difficult to root for and easier to simply observe. The oversight of a basic television principle has made the second season more frustrating than it ought to be. It’s as though the writers feel they’ve done the necessary legwork to make the storyline provocative, when in reality, the majority of last season saw most characters show up, rather than shape into something worthwhile. The funeral sequence embodied this problem; Gordon’s anger was justified, but it wasn’t resonant. I understand his pain, but I cannot connect to it because I have no idea who Officer Parks is. For that matter, I have no idea who James Gordon is. His battles are not mine, and when he runs into a hail of gunfire I don’t fear for his life as much as I watch with passing curiosity. This lack of connection makes an episode like “The Son of Gotham” a tough sell. It was a fine hour for a comic book drama. It was well-paced, decently written with drama and comedy and had the best action Gotham has ever put on screen. It was a fine effort, a fully rounded entry that could have been spectacular, but the entire show falls short due to its shallow nature. There was every opportunity to reach similar heights as last week’s episode of Agents of S.H.I.E.L.D., a slick, sly hour that contained an intense range of emotion and hit them all with a defiant punch. “The Son of Gotham” progressed the season’s larger story in fascinating ways, but it lacked the punch. I love the idea of bringing in, and connecting Theo, to the Order of St. Dumas, but I wish the show had moved more swiftly with its involvement. The “monks” as they’re known have the potential to be terrifying, and coupled with Theo’s own fighting ability unveiled last night, the combination could be deadly in the fall finale and the season’s second half. I even enjoyed Bruce’s storyline, which saw him team up with Selina to trick Silver St. Cloud (finally). Bruce is still too involved in the show for my liking and I would prefer to watch him deal with the loss of his parents as a normal child, but if I have to see him rush into becoming the world’s greatest detective, let it be in compelling ways (with top-notch guests like Tommy Flanagan). There was great fight choreography, with three stellar bouts including one featuring Alfred in his most badass performance yet. The hour also included humor thanks to the continuation of Ed and Penguin’s absurd Odd Couple adventure, though upon hearing of Galavan’s acquittal, Penguin wasted no time throwing himself back into the game. When you look at this year’s story, which, as promised, has been serialized, the ideas are there. But Gotham lacks the connection that others in its genre, namely The Flash and Agents of S.H.I.E.L.D. have been able to create. I often find myself absorbed in those comic counterparts because I care about the characters, and fear what horrendous obstacles they will face each week. With Fox’s entry in the comic world, I am more a passive onlooker. ?So much has changed in Gotham’s second season that it’s as if the show is redoing its premiere effort. That’s not a bad way for the writers to approach the situation. Little good was done in season one, putting a Herculean task on the shoulders of season two. Thus far, through 10 episodes, the sophomore effort has helped reverse much of what made the show the laughing stock of comic book television, but the writers need to take a long look at their characters. They need to approach them the same way they approached the serialized story, and build them over a long stretch, until the audience feels genuine connection. That’s not going to happen by next week, but we can hold out hope that it will come by season’s end. The bright side is that last year’s best episode effort came in the fall finale, and after a strong lead in this week, season two has a definite chance to continue the trend.